Recruitment Talk by TFI Digital Media Ltd. Registration will be closed at 11:00, 30 Nov 2018. Those who are not registered may try to walk in on a first-come, first-served basis. TFI Digital Media Limited is a Hong Kong based technology provider that specializes in video-related technology research and solutions. Our offerings include products and services across various industries – business, culture and arts, education, entertainment, healthcare, hospitality, real estate and tourism. Our team at TFI strives to bring content, culture and people together through innovative technology. We are actively recruiting talented individuals with Computer Science and Engineering background to join our Technology Graduate Trainee Programme. The 2-year programme allows you to gain first-hand experience on working with our experienced professionals from Research, Frontend and Backend Development, as well as Project Management and Business Development divisions. 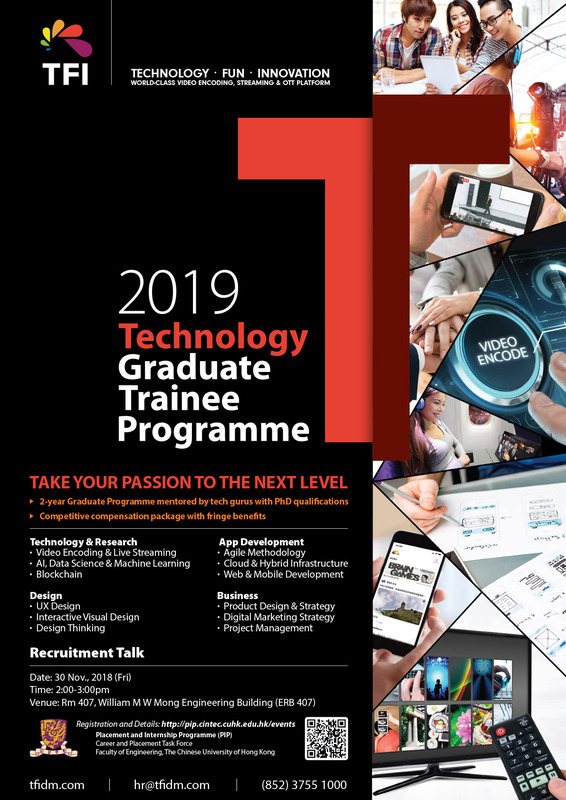 In addition to technical skillsets, the Graduate Programme also comprises of workshops to provide you a comprehensive understanding of the online video business, with exposure across Product Development, Business Development and Marketing teams. We also encourage you to utilize TFI’s resources in fields such as UX Design, AI, Data Science & Machine Learning, Blockchain, Large Scale Database Management & Network Design, to develop your interest. We believe a complete Software Engineer requires understanding of the entire business as a whole. Focusing on your career development, the Graduate Programme is designed to let you discover your preferences and further polish your strength. Upon completing the 2-year Graduate Programme, you can further establish yourself as a Software Engineer or relevant role in other business areas. We understand that choosing your career path straight out of university can be challenging and we are here to help you figure out what type of role and business is right for you.